The battle, which began on the 25th September and died out on the 13th October was a battle of giants, and in no previous battle had the British Army ever had more men engaged or suffered greater casualties. In such a modern battle it falls to the lot of a few units to deliver the main assault, while to the majority is allotted the duller but no less arduous task of deceiving the enemy as to the real point of attack, usually by launching a bold assault on a part of his front, with the knowledge that the assault has no weight behind it. The British (on the left) on a front of some seven miles from La Bassee Canal southwards to the village of Grenay, and the French (on the right) prolonging the line along the Bethune-Arras Road, but making their principal thrust farther south—in Champagne. To help the main effort, subsidiary attacks were to be made simultaneously along practically the whole of the remainder of the front—north of the La Bassee Canal, along the Ypres Salient, on the Yser Canal (by the Belgian Army), and from the sea coast by British monitors. 3rd and 14th Divisions of the Vth Corps (Allenby), Second Army (Plumer). Givenchy)—all belonging to the First Army (Haig). Main Attack.—Haig's First Army, consisting of the remainder of the 1st Corps (Hubert Gough), the whole of the IVth Corps (Rawlinson), and in reserve the 3rd Cavalry Division and the XIth Corps. From left to right (i.e., from north to south) the Divisions were as follows : Part of the 2nd, the 9th (Thesiger), the 7th (Capper), the Indian, the 15th (New Army), and the 47th (Northumbrian T.F.). The 2nd Division (Horne) was astride the La Bassee Canal, the 5th Brigade- (Cochrane) to the north of it, at Givenchy, the 6th Brigade (Daly) to the south of it, at Cuinchy, and the 19th Brigade (Robertson still farther south. The canal was the extreme left boundary of the main attack. At 5.50 a.m. (25th September) gas and smoke were discharged from our front for the first time in the war, and subsequently the assault commenced. With the exception of the left brigades (just south of the canal), who found themselves confronted with uncut wire, the 1st Corps and the IVth Corps advanced with magnificent dash and captured the whole of the German front line from the Hohenzollern Redoubt southwards, as well as the village of Loos. The German second line was also pierced, and before nightfall Hulluch and Haisnes were seriously threatened. Throughout the day the fighting had been very severe and the casualties extremely heavy, the Germans counter-attacking fre­quently, in spite of tempestuous weather. Sir John French's Dispatch describes the position of the British line that night: " From the Double Crassier, south of Loos, by the western part of Hill 70, to the western exit of Hulluch, thence by the Quarries and western end of Cite St. Elie, east of Fosse 8, back to our original line." During the night, which continued wet and stormy, the enemy delivered several counter-attacks, which, however, proved little to his advantage, except at one or two points where our troops were forced back for a certain distance. Next day the advance was practically held up, despite the arrival of three fresh Divisions (Guards, 21st, and 24th), and on the 27th September no great headway was made, ground being won back at some points, but lost at others. The 28th was devoted to con­solidating the position gained, and the line remained practically unchanged. In the meanwhile the French on our right had met with heavy resistance, and were unable to get suffi­ciently far forward to protect the British right flank. This was represented by Sir John French to General Joffre, who at once ordered the IXth French Corps to relieve our troops holding a part of Hill 70 and the village of Loos, and this was effected on September 29th and 30th. The Germans continued to make strenuous efforts during the next few days to recover the ground which they had lost, and the fighting was severe. These attempts had little success, and on the 8th October the enemy, in desperation, delivered a violent counter­attack all along the line from Fosse 8 on the north to the right of the IXth French Corps on the south. A very heavy bombardment preceded this counter­attack, which he launched with 28 battalions in the front line and larger numbers in support. Their recovery of ground was practically nil, and their losses enormous—estimated at no less than 8,000 or 9,000 in killed alone. Sir John French in his Dispatch summed up the result of these operations which commenced on the 25th September by saying that the enemy's position assaulted and carried with so much brilliancy and dash was an exceptionally strong one, with a front of some 6,500 yards; 57 officers and 3,000 other ranks were taken, besides 26 field guns, 40 machine-guns, and 3 Minenwerfer. So much for the main British attack, in which the Regiment was not represented, since its battalions 2nd and 5th were employed in the subsidiary attacks named above. 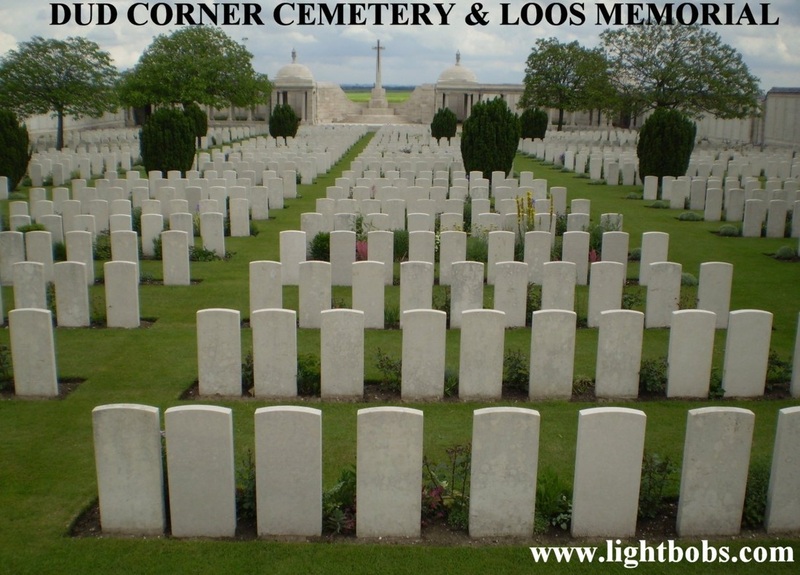 The battle of Loos can hardly be considered a great British victory, although the first assault was a magnificent success, and the subsequent fighting-worthy of the traditions of the British Army. Yet we were unable to hold all the ground gained, and our losses were very heavy, amounting as they did to some 2,000 officers and 50,000 men. What the enemy lost it is not possible to say, but it is quite certain that his casualties wore far in excess of ours. The simultaneous attack delivered by the French in Champagne was a most brilliant performance, and resulted in a decisive victory. Attacking on a front three times as wide as that of the British main attack at Loos, and with three times as many men, they swept all before them in their first impetuous assault, and continued their successful advance for several days. No fewer than 25,000 German prisoners and 150 guns of various calibre fell into their hands before the enemy was able to stay their progress. 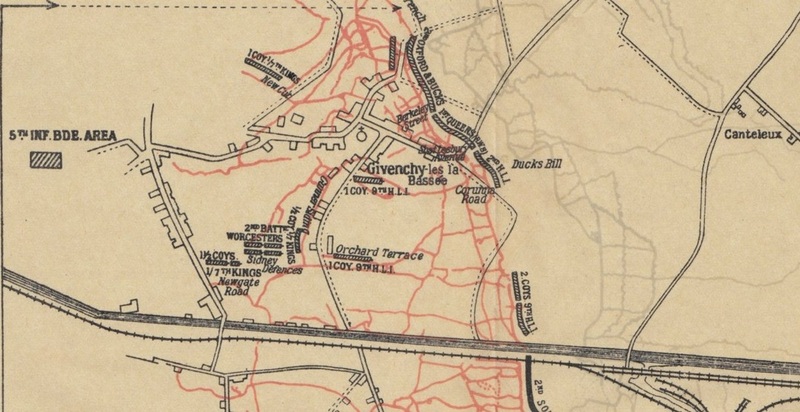 Battle of Loos Subsidiary Attack at Givenchy. September 24th.-Our artillery bombarding heavily all day. In the evening battle stations were occupied, and Regimental H.Q. moved into the dug-outs which had been prepared for the purpose. They were of the most atrocious design, for, though safe enough, we were fearfully cramped for room, and officers and signal staff were all far too close together for working satisfactorily. This was the eve of big operations on the 1st Army front. The frontage of the Regiment was between Berkeley Street (about 100 yards south of the Shrine) and the north end of the northern group of craters. On the left D Company (Southey), with B in reserve. The role of the 2nd Division was to do what it could to keep the enemy occupied, but not to press forward too much, as no reserves were available to help us. Having regard to the 1st Army's task, this was undoubtedly a necessary operation, but a most unsatisfactory one for us taking part in it. Gas for the first time was to be let off along the whole Army front, and an officer of the Special R.E. Company spent the night with us. Inci­dentally I may mention that his hourly reports were most unfavour­able, as the wind on our front was far from satisfactory. Brigade H.Q. were at Fanshawe Castle, between Pont Fixe and Windy Corner. Some particulars of arrangement may be of interest : Packs, including waterproof coats, were stored, and the following equip­ment was worn Haversack in the middle of the back, with water­proof sheet and cardigan waistcoat rolled on the belt below. (large) of the platoons, and other ranks the number (small) of their platoons. The five men carrying vormoral sprayers wore an armlet with the letter V; orderlies wore a red and white band on one arm; while the C.O. and Adjutant wore a small piece of regimental ribbon, pinned on the shoulder. Company N.C.O. 's surplus to an establishment of 1 Platoon Sergeant and 2 N.C.O. 's per section. By Corps Orders only 20 officers were permitted to be taken into action. We had 2 men killed and 3 wounded today. September 25th.-Very early in the morning we were told that zero hour was fixed for 6 a.m., and that, for 10 minutes previous to that, gas (officially called "Accessory Cylinders") and smoke would be discharged from our front trenches. The 5th Brigade was to attack half an hour earlier than the attacks southwards. In this neighbourhood, at the above hour, the air was practically motionless, with the result that the gas hung very considerably, and in our part of the line did more harm to our men than to the enemy, who, in only very few cases, were found to have suffered from the effects. A Company got across the 200 yards well, and soon gained a footing in a good length of the Huns' front trench, some parties reaching the support line or even farther. But the enemy, by bringing up reinforcements, gradually made our hold on the captured trenches more and more precarious, and in the end, by 11a.m., A Company was back again in our own front line. Between 8 and 9 a.m. Hughes had taken out a platoon of C Company to assist A, but could make no headway across No Man's Land under the enemy's artillery fire, which by then was pretty severe everywhere. even blew back into our own trenches. Moreover, in front of the company were some strongly defended craters, and the enemy's machine-guns were ready to meet an advance. Newton-King, with a couple of sections, attempted to outflank these par­ticular craters ; but, after rounding one corner of them, nearly the whole party was destroyed. Many of D Company though wearing smoke helmets, felt the effects of our gas, but kept their position in spite of it. The other battalions of the Brigade fared no better. The wind was so perverse with the Glasgow Highlanders that they never even left their trenches, whilst in the case of the 2nd H.L.I, at Duck's Bill and the 1st Queen's in between, although two companies of each reached the enemy's line, they were also driven back. Vidal made a brave effort to take a couple of our machine-guns across, but perished in the attempt. Altogether it was a most unsatisfactory affair, and the only consolation that I could derive from it was the knowledge of the fact that Owen's company was the last to leave the enemy's lines. Between 6 and 11 a.m. our trenches were pretty heavily bombarded by whiz-bangs, while still heavier shells were directed on the neighbourhood of the church. The remainder of the day and night was quiet. The 5th Brigade had been told not to press their attack con­tinuously should the first results be fruitless. A section of the 5th Field Company R.E. was in readiness to assist should the attack be successful. A working party of 100 men of the 7th King's (Liverpool) Regi­ment was employed in digging out a communication trench, but the work did not proceed very far. In one part of the line a party similarly employed very greatly impeded the advance of reinforce­ments on this line of slight cover. 2nd Lieut. E. R G. Hughes. 2nd Lieut. L. A. Vidal. Lieut. P. L. C. Webster. And 60 men (all afterwards presumed killed). Total casualties, 236 officers and men. The O.C. this company judged it best to take over the two remaining platoons, and these did not apparently have great difficulty in crossing over either. This company took a telephone with them, which lasted for some time, but I got hardly a message, as the O.C. the company was away on to the German second line. For some time they were not attacked, and one officer (Lieut. Chevallier) was able to take down some information ("A," attached), from his knowledge of German, given by the prisoners who were captured. has not yet been seen or heard of. The enemy, by the expenditure of a plentiful supply of bombs, gradually drove back this company, and 1 believe the Queen's, on their right, was forced back also. At one time this company was almost surrounded, and it was as a last effort that Lieut, Jacob was allowed, with the remainder of our bombs, to make another counter-attack. I regret to say that this officer is missing, and, I believe, wounded. I had meanwhile ordered out two other platoons, to reinforce this company, but the retirement took place while they and the Brigade Bombing Party were on their way out. The O.C. the leading company had asked direct for a reinforce­ment from the company supporting him, and one platoon, under a young and energetic officer, went out over the parapet to his assistance. I have scarcely any information at all as to the doings of this platoon, but its commander (2nd Lieut. Hughes) has been found dead. The two platoons which I had ordered as reinforcements were told to go by the Lone Tree Sap. what damage was done or how the surface of the neighbourhood was altered. The party on the extreme north found the Germans lining the inside of the crater ready with bombs, and also several enemy machine-guns ready to receive them. No progress was possible, but fighting between these two parties took place. The right half of the company's attack was also held up, though some very nearly reached the German line. One report informs me that the wire here was very little, but my impression is that the wire is in a sunken trench, and almost impossible to see from our line or its observing stations. 3. Gas.—When the cylinders were opened the gas hung fright­fully, and many of our men were gassed, but I have good reason to believe only slightly. at any rate. Captain Southey has just informed me that the Germans were seen lighting a line of fires, just in front of their second line, from which at once flames sprang up. During the afternoon, and on the arrival of a corporal of the 186th Company R.E., I sent an officer with him to inspect each emplacement. 4. German Artillery.-—The fire of their " whiz-bangs " was very incessant and very accurate, and was directed principally on our two front lines, where many casualties occurred. A good many 8-in. shells came over, and fell principally near the church and main communication trenches. 5. Communications.—Communications worked wonderfully well, though between Battalion Headquarters and companies during most of the morning communication was kept tip by means of runners. 7. Working Parties.—The 100 men of the 7th King's did their workatisfactorily, as far as I can ascertain. 8. Section R.E.—There was no scope for the employment of these men. General Idea.—I decided to attack the German trenches from A.9.a.94 to A.9.b.12, on a frontage of one platoon. The Attack.--At 6 a.m. the first line advanced and reached the German frontline trench without opposition, though the first men to get into the trench state positively that no Germans were gassed. Several Germans appear to have been killed a short time previously by shell fire. Those Germans who were in their frontline trench were either shot or bayoneted by our men. turned right-handed and reached Point Z about midway between Points 06 and 03 1/2 . They were heavily bombed there, and, on their own supply of bombs being exhausted, retired to Point 3 1/2. (b) Two Right Sections of Front Line.—These appear to have had a few casualties from rifle fire before reaching the German trench. A good many of the Queen's men were with them.They entered the trench about Point K and worked up to Point 14. Between these two points they estimate that there were at least 20 Germans killed—some before they got there, the remainder killed by them. Having reached Point 14 they were held up by bombs. (c) Two Left Sections, Second Line.—These seem to have had only 2 casualties before reaching the German trench, which they also entered about Point X and worked up to Point 14. Having thus reinforced our men who were already at that point, they were able to bomb on and reach Point 25, i.e., the German second line. This they are certain of, and it is corroborated by Lieut. Chevallier, who was with the right of our second line. They advanced with their right on Lone Tree Sap, and were mixed up with the Queen's, but got to the German trench with very few casualties. They pushed on to Point 14. On their way they killed about 6 Germans in a dug-out and passed several others dead in the trench. This party seems to have been led by an officer of the Queen's .Regiment right up to Point 25. He was wounded, and Lieut. Chevallier, who was in rear, came up to Point 25. He is quite certain that he was at that point. They remained there until they had (or rather could get) no more bombs, and then retired, somewhat hastily, to the German front line, apparently without loss. (d) No. 3 Platoon, on the left, advanced in line, and suffered a good deal from machine-gun fire, coming front a crater on their left, and also from shrapnel. Having got into the front line they were ordered to move a little to their right, as there was then a gap between us and the Queen's. (e) No. 4 Platoon advanced via Lone Tree Sap and the crater marked H, arriving there without many casualties. Shortage of Bombs—I cannot explain why we ran so short of bombs almost immediately, except that the wristlet strikers were in some cases lost, and in others quite damp. A dozen boxes of matches (which I had in my pocket) were useful. If it had not been for a large supply of German bombs we should have had to retire long before we did. Retirement.— We eventually barricaded the German trenches about the Points X and K, i.e., holding on in their first-line trench for a length of about 30 yards. We eventually ran out of bombs altogether, and I gave the order to, retire, which we did by way of Lone Tree Sap. I do not think that the Germans were entirely aware that we had evacuated their first line until we were just out of it. When we were retiring, I suddenly came upon a very large crater, in the nature of a redoubt, and there I endeavoured with a little success to rally our men, to let the wounded get on first. I did not know that this place existed. I stopped there for about five minutes, and then retired on to our original first-line trench. German Casualties.—I think it is safe to say that we accounted for certainly 50 dead Germans, as the N.C.O. 's and men think there were at least 70 dead in those trenches. 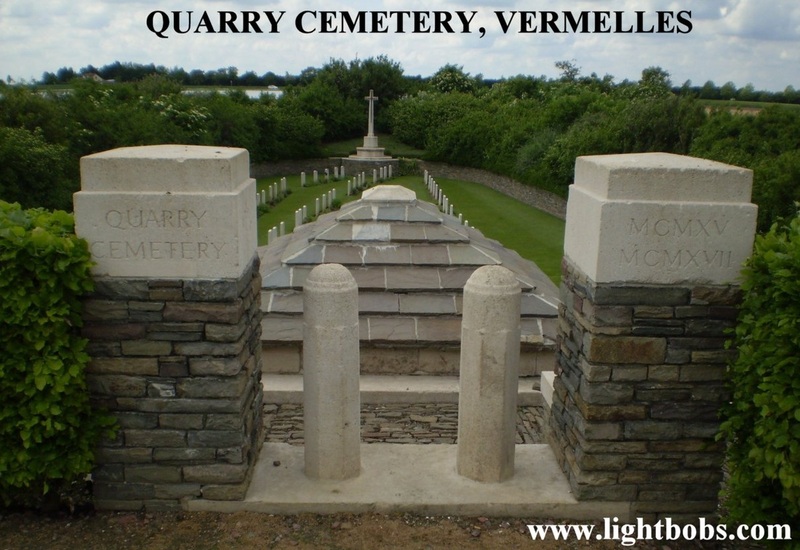 A Company’s Casualties.—Thirteen men only are known to have been killed in the German trench. There must have been more. 45 are known to have been wounded and 49 missing, but I cannot vouch for accuracy.
" SECRET.—Not to be carried forward in an Assault. "TIME-TABLE OF GAS AND SMOKE.
" 0.50 to 0.60. Smoke. Turn off gas at 0.50 and thicken up smoke by using extra candles, grenades, etc.
" Note.—From 0 to 0.60 hostile trenches will be kept under continuous shrapnel fire. At 0.60 artillery -will lift as required.
'" Smoke barrages on the flanks of the assault should be continued wherever possible after the attack has been delivered.
" (b) On the whole of the front where gas is not used, smoke is to be kept going everywhere from 0 to 0.60." September 26th.-We remained in Givenchy trenches and reorganized the line. C Company had also lost a number of men. In the evening Regimental H.Q. returned to Windy Corner. A good deal of rain fell today, and repairs necessitated by this and the heavy shelling gave the men much hard work. September 27th.-(Givenchy trenches.) Fortunately very quiet. Most of the officers and men are considerably done up. September 28th.—Pretty quiet all day, and fine until the evening, when it rained very heavily. At 10 p.m. the 1st Seaforth Highlanders (attached to the Sirhind Brigade) arrived from the north to relieve us. I pitied them coming into such a complicated system of trenches for the first time and on such a night. The Regiment moved into billets in the Orphanage, Bethune. September 29th.-In the afternoon we moved to Essars, where it was a tight fit, as part of another battalion was already there. More rain. September 30th -(In billets at Essars.) The men very busy all day getting cleaned up and rested. October 2nd.-In trenches near Hulluch. This part of the line was taken by the 7th Division during the recent fighting. Where we are now was a line of German gun emplacements (8 guns), from which the Huns had been driven out. They left behind them several guns, which our batteries had not been slow in removing. There was a good deal of gun ammunition still about, as well as new sights and other portions of artillery equipment. We have the benefit of several very complete officers' dug-outs furnished with beds, tables, chairs, fire-places, etc., and fitted up with an elaborate system of electrical communication; but this had been destroyed before we arrived. Very little could be seen of the enemy's infantry opposite to us. There was comparatively little shelling by day, but a good deal at night, when an attempt was being made by the 2nd H.L.I., close on our left, to turn the Germans out of about 200 yards of trench, where they had forced an entry in the line yesterday, before we came in. The attempt to regain this part of the line was only partially successful. Although we were shelled pretty continuously, it was extra­ordinary how little damage was done, beyond slightly damaging the trenches. The greatest trouble was keeping our candles alight, as blasts from the shells kept extinguishing them. Everyone was busy day and night improving the line of trench, which required deepening, though the presence of many good and deep shelters afforded a certain amount of safe cover. B and D, in gun trench (G.l8.b.4.0.-G.12.d.5.5.). A (only 70 men), in a support trench, 120 yards in rear. C (100 strong), in reserve in German first line trench (G.l7.b.5.7.-G.11.d.6.l.). Casualties, 2 killed and 3 wounded. October 4th.-At about 1.30 a.m. the 1st Grenadier Guards (Guards' Division) relieved us, but it was 6 a.m. before the last company reached its billets in Beuvry. A draft of 149 other ranks arrived last night and was posted to companies today. This forms the 32nd reinforcement. October 7th.-Company training commenced for the new drafts; also some useful classes in wiring drill and bombing, with the latter special attention being given to attack tactics by small parties. The Regiment, together with the 2nd H.L.I., was placed in divisional reserve to the 7th Division. October 10th.-Out early to reconnoitre our new trench area near Auchy, just south of the La Bassee road. The Regiment rejoined the 5th Brigade, moved to Cambrin, and took over second-line trenches in rear of Z.I from the 2nd Yorkshire Regiment at 5 p.m., being in support to the Queen's and Glasgow Highlanders, but in trenches—chiefly strong points. A and C in Headquarter Trench, near Lewis Keep, Sim's Keep, and Railway Keep. October 11th-12th.-Our artillery heavily bombarded the German line round Fosse 8, Coron de Perkins, and the Hohenzollern Redoubt. Very quiet at present. October 13th.—Our artillery carried out a heavy bombardment between 12 and 1 p.m. Gas and smoke were then let loose, and at 2 p.m. the 46th (North Midland) Division, on our right, attacked the Hohenzollern Redoubt, a formidable Hun work. I obtained a very interesting view of a good deal of it from one of our artillery O.P.'s. 5th Brigade, was killed. One officer, 2 N.C.O.s, and 24 men of the Regiment took part in this attack. October 14th.- In the afternoon we moved up into the front line and look over Y.4 Section from the Queen's, the North Midland Division (46th) being immediately on our right. A and C in support. There was a great deal of work to be done in the front lines, as is always the case after an attack. The trenches had been badly knocked about, and a lot of salvage of grenades and general cleaning up had to be carried out. Also, a new sap (Guildford Trench) was in course of construction. The sap ran in the direction of the German line, and from this end efforts were made to join up with the troops who were holding a portion of the Hohenzollern Redoubt. A party of C Company had started making this Guildford Trench on the night of the 13th, and in the early morning of the 14th, when getting away, Lieuts. Ridout and Mills had been wounded. Strong fatigue parties were at work every night on the trench and its extension, which was ultimately connected with the Guards' Division, holding the Hohenzollern Redoubt. A party (from A and B Companies) was at work all this night, doing fresh wiring on both sides of the new sap, and during the early hours of the 15th October a German officer and 1 private walked into the party and were taken prisoners. October 15th.-Still very busy repairing trenches. In the evening we commenced work on an important sap. The enemy shelled our front line with heavy guns, and B Company suffered somewhat. Not much sleep tonight. October 16th.-Weather fortunately fine but dull. Enemy shelled us constantly, but not so heavily as yesterday, when we had some 20 casualties. Sap going well. Another sleepless night. October 17th.-A very noisy day. We shelled from 5 to 7 a.m., and the enemy replied with field guns until 9 a.m. Then from 10.30 a.m. to 2.30 p.m. their heavy shells were falling in all directions on our front and support lines. Our mess kitchen was entirely destroyed. A quiet night followed, and our working parties made good progress. October 18th.-A certain amount of shelling after noon. At 3 p.m. we were relieved by the 2nd Worcesters, and marched to billets in Bethune, at the Montmorency Barracks-French barracks, with good accommodation. We were not sorry to get a rest, for the last five days had been really strenuous. The weather is becoming decidedly colder now. Casualties from 14th to 18th October : 10 killed and 17 wounded. The 35th reinforcement (80 N.C.O. 's and men) arrived. October 20th.-We were called on to furnish working parties (450 during the day and another 100 at night) to remove empty gas cylinders. The parties were taken to Cambrin and back in motor lorries, but the work was heavy. October 2lst.-The Regiment moved into scattered billets in farmhouses west of Gonnehem, known as the Belle Rive area. October 22nd.-The Regiment moved again into fresh billets in farm-houses, about 2 miles farther west, in the area known as Cense la Vallee. October 23rd-28th.-(In billets in La Vallee area.) On these days a new system of bombing attack was practised by all companies, and the usual drills and exercises were carried out. The weather was exceedingly bad, most of the ground being under water. In consequence work was greatly interfered with. Between the 20th and 27th small parties of reinforcements (20 in all) arrived. October 29th-November 2nd.-The Regiment moved on the morning of the 29th October to billets at Annequin and Cambrin. Fatigue parties were out every day on work in the trenches. The weather was very wet. 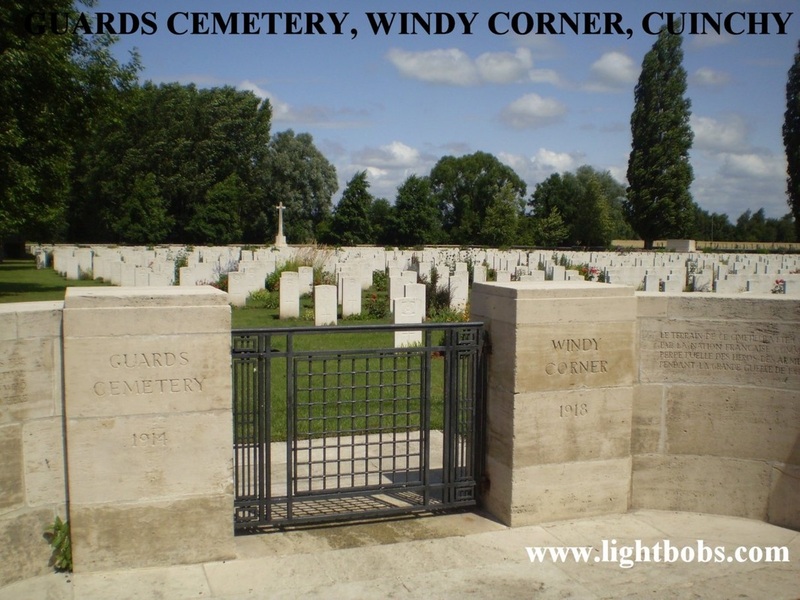 Around the walls of Dud Corner Cemetery are the panels of the Loos Memorial. 78 Officers and men of the 52nd are commemorated on this memorial who fell between 25th September - 15th October 1915. 19 Officers and men of the 52nd lie here 24th - 25th september 1915. 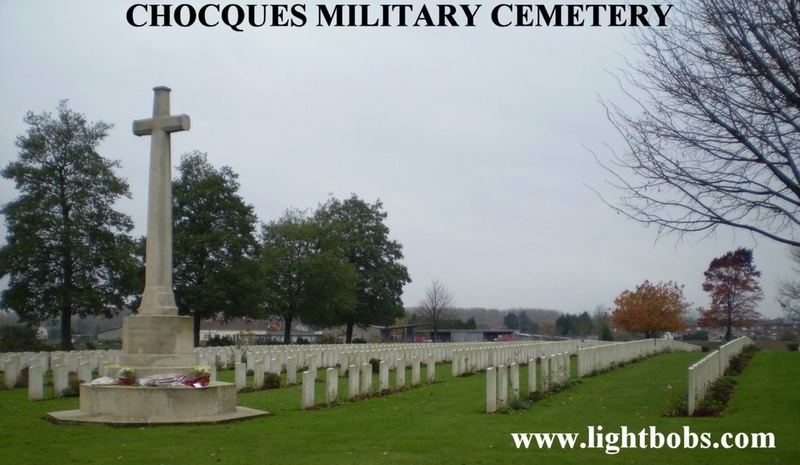 6 men of the 52nd lie here 25th September - 20th October 1915.